We discuss spatial selection techniques for three-dimensional datasets. Such 3D spatial selection is fundamental to exploratory data analysis. While 2D selection is efficient for datasets with explicit shapes and structures, it is less efficient for data without such properties. 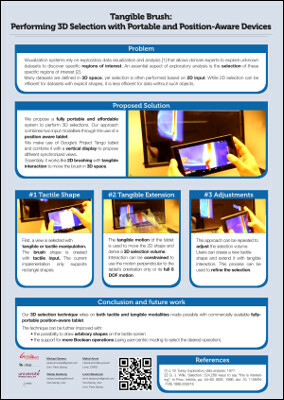 We first propose a new taxonomy of 3D selection techniques, focusing on the amount of control the user has to define the selection volume. We then describe the 3D spatial selection technique Tangible Brush, which gives manual control over the final selection volume. 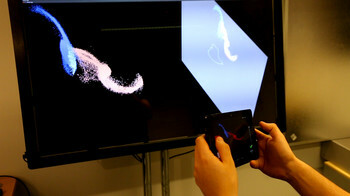 It combines 2D touch with 6-DOF 3D tangible input to allow users to perform 3D selections in volumetric data. We use touch input to draw a 2D lasso, extruding it to a 3D selection volume based on the motion of a tangible, spatially-aware tablet. We describe our approach and present its quantitative and qualitative comparison to state-of-the-art structure-dependent selection. Our results show that, in addition to being dataset-independent, Tangible Brush is more accurate than existing dataset-dependent techniques, thus providing a trade-off between precision and effort. Get the videos: * download the paper video (1080p25, MPEG4, 203MB), * watch the conference preview video on YouTube. watch the poster video on YouTube. watch the 30s preview for the poster on Vimeo.